Fights of BEC race finals were really worth the title of grand finals. It was a resultative battle with lots of tense, some crashes and fights until the last seconds of the race. Grand finals has started with a painful rollover off “Skuba racing” BMW and has ended with clear champions of the season: victory belongs to GSR Motorsport team. Friday afternoon brought participants up for practices and technique checks. However, some of them had to deal with serious technical issues. Two engines were replaced during the night before the race. 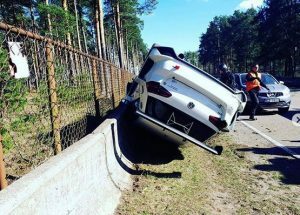 Lithuanian team “RD Signs” has waited for their engine for BMW Z4 to come from Lithuania, meanwhile “London Grill Racing Team” has placed an engine of Estonian “ALM Motorsport” team. 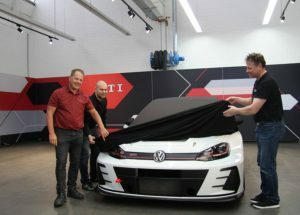 “ALM Motorsport” had an issue with gear box and as it was impossible to repair it, the engine was borrowed to Lithuanian team. Changes under car hood also implemented changes behind the wheel. 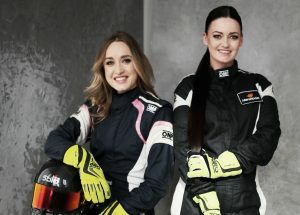 Estonians “ALM MOtorsport” racers Robin Vaks and Sten-Dorian Piirimagi has joined the forces with Eimantas Navikauskas and Oskaras Brazaitis. Another driver Julius Adomavičius joined Arūnas Gečiauskas behind “Circle K milePlus racing team” Porsche wheel. After final registration and scrutineering, 19 teams have started in qualifying sessions. Racing pole position was secured by “Skuba racing team” as they managed to reach 1.16.264 seconds lap time. However, good job during qualifying did not mean good finish of a race, too. 30 minutes after start of the race, technical failure has resulted in a painful crash and the car rolled four times. The driver Džiugas Tovilavičius was fine, however, it was the last race for their BMW. The rest three hours of the race were much calmer with any serious incidents. However, a lot of cars came back to the garages damaged and marked with fight marks as there were lots of small contacts between of participants. The fights for victory and podium were until the finish flag. The gaps between leading teams in overall and in classes were really small and any mistake could cost the season victory. 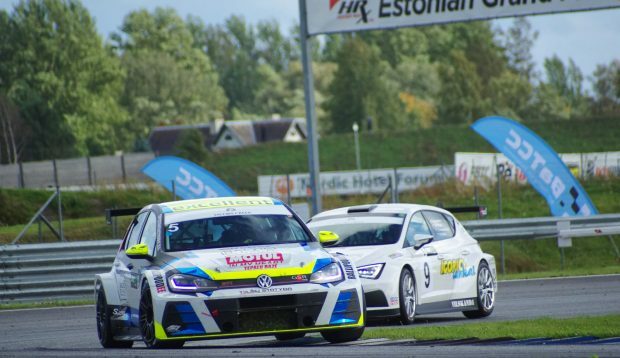 Finally only 2.46 seconds being ahead of “Hegelmann Transporte by Algirdai racing team”, “GSR Motorsport” represented by Ernesta Globytė and Mikk Maaten won the race and the season overall. “Hegelmann Transporte by Algirdai racing team” took the second place in the race. The third place in overall was taken by “Circle K milePLUS racing team” with Porsche 911 GT3. However, season overall classification looks a bit differently. After all points being counted, second place belongs to “Rotoma Racing” team and the owner of the third place is “Energizer Racing” team with “VW Golf GTI TCR”. First place of A3000 class in this event as well as in all season belongs to “Black Rose Racing” team from Finland, as “A3000+A” class leader is “ITCC Racing” team from Lithuania. “Cone forest racing team” came second and took all the points needed to push “Telšių statyba“ to third place in season classification. In “A3000+T” class, behind “GSR Motorsport“ and “Hegelmann transporte by Algirdai racing“ teams there were “Igorio lankai“ team happy with it’s third place. However, in season classification second place belongs to “London Grill Racing Team”, as “Energizer racing team” is in the third place. Diesel class leader in the event and in season classification is the same BMW 330D of “PGM Technika racing“ team. Second place in the event was taken by VW Golf of “Redus LT” team and the third place in a class taken by “Sparti reklama PF Kekava“ with „BMW 120”. However, in season classification second and third place swaps in between and “Redus LT” moves to third place. As “Skuba racing team” left the race early, the winner of GT class was “Circle K milePLUS” team with Julius Admoavičius and Arūnas Gečiauskas. Second place was taken by “Rotoma Racing” with BMW M3 and the third place belonged to “Porsche Baltic” team. However, season overall in this class looks a bit differently: the champion title of GT class belongs to “Rotoma Racing”, second place winner is “Porsche Baltic” with Porsche Cayman GT4 and the third place owner is “Skuba Racing” team.